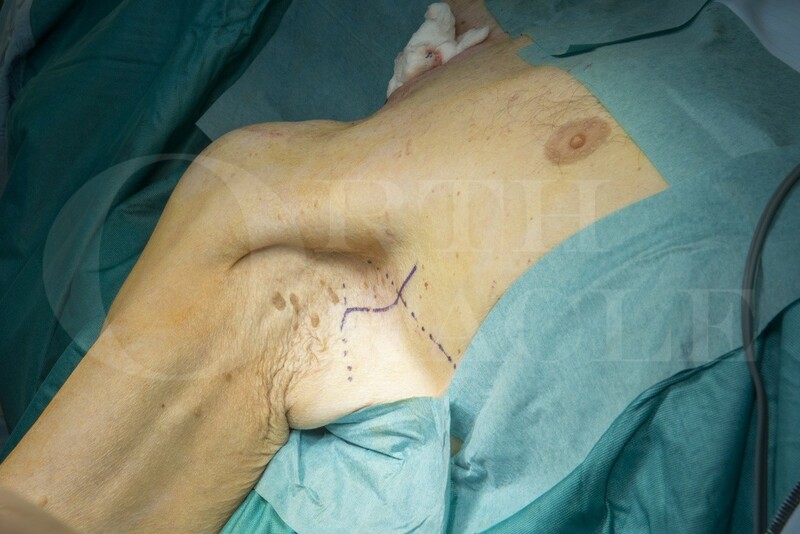 Learn the Thoracodorsal nerve to long thoracic nerve transfer for scapula winging surgical technique with step by step instructions on OrthOracle. Our e-learning platform contains high resolution images and a certified CME of the Thoracodorsal nerve to long thoracic nerve transfer for scapula winging surgical procedure. The serratus anterior is supplied by the long thoracic nerve from C5,6 and 7. Long thoracic nerve palsy may follow traction injury, viral neuritis or nerve entrapment. Paralysis of the serratus anterior leads to winging of the scapula with poor scapula elevation, poor scapula control and impaired upper limb function, particularly with the arm in the forward elevated position. Exploration and decompression in the [osterior triangle of the neck, at the lateral border of the upper ribs or within the axilla may identify a cause of dysfunction that may be amenable to decompression. This is described elsewhere on OrthOracle. Failed recovery following decompression or persistent dysfunction at 6 months may be treated with a distal nerve transfer from the thoracodorsal nerve to the lower serratus anterior. Nerve transfer offers a reliable method of reinnervating paralysed muscles and utilises the proximity and redundancy of adjacent motor nerves close to the motor point of the paralysed muscle. Reinnervation distances are typically short resulting in good functional outcomes even when there is a delay to presentation or when other initial treatment modalities have failed.